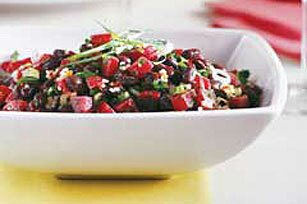 Serve a side that is out of the ordinary tonight with our Roasted Beet and Bean Salad Recipe. Our Roasted Beet and Bean Salad Recipe is tossed in an Italian dressing and garnished with fresh lemon juice. How zesty! You'll be glad you tried something new when you serve this special salad. Mix beans and parsley. Season with salt and pepper to taste, if desired. Place beets on platter; top with bean mixture. Sprinkle with onions. Pour dressing over salad just before serving. Squeeze lemon juice over salad. Substitute 2 cans (15 oz. each) black beans or red kidney beans, drained and rinsed, for the cooked dried black beans. Wash beets; pierce in several places with fork. Place beets in center of large sheet of foil. Drizzle with 1/4 cup KRAFT Zesty Italian Dressing. Fold up sides of foil to enclose beets; seal foil packet tightly. Bake at 400°F for 45 min. or until beets are tender. Open foil; let beets stand in foil until cooled. To peel, gently rub skins of beets with cloth or paper towel until skins are removed.